Galaxies, star clusters such very great, gases and dust are considered as small islands in the vast universe. 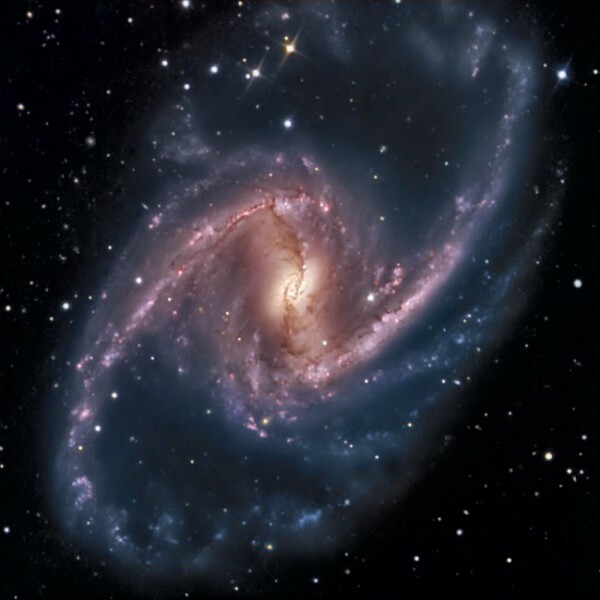 An example is the NGC 1365 of 60 million 200 thousand light years and light-years across. The galaxies are, as you can see, very separated from one another but at the very time linked together. Knowing that what we see is the 5% of the matter in the universe, we know that there is a glue that holds together galaxies, dark matter. Dark matter is 95% (more or less) of matter in the universe. The latest thinking is that dark matter is unlike normal matter and therefore we do not see. The more normal matter no less dark matter is and vice versa. Hence, in the vast space between galaxies, dark matter is more usual to meet. The glue is considered as it is precisely what keeps galaxies glued to each other and prevents the expansion of the universe is so fast. In fact, there is a correlation study between the dark energy (remember, matter and energy go hand in hand) and electromagnetic waves that helps explain the matter (and dark energy), at least its consequences, like gravity to calculate its consequences are not the “what” exactly. Perhaps this is referred to small islands in the sea galaxies in the universe.